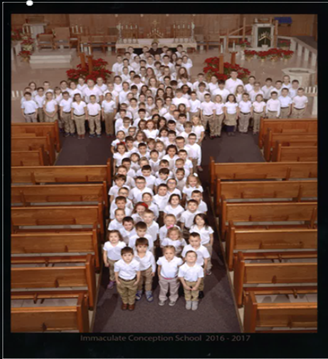 Immaculate Conception School aims to provide a faith-filled educational experience for your child. We look forward to welcoming your family to ours! We’d love to talk to you and meet your family. Contact us today to request more information about ICS. To help your child hit the ground running next fall, we have provided a calendar of what you can expect throughout the year as you prepare for enrollment at ICS. Stay up to date on ICS students, accomplishments, and various reminders so you can get in the loop right away! Look for various informational pieces regarding new programs and offerings at ICS. Apply for Tuition Assistance by the end of February. Attend ICS Open House (PS-8) for current families, parishioners, and the community. Watch for a letter outlining financial aid package. Set up Tuition Payment Plan with ICS through Firelands Federal Credit Union. Make any necessary doctor appointments required for school enrollment. Attend the ICS Annual Chicken BBQ and Open House. Begin an exciting new school year!